Can’t quite make out that object in the distance? Use your fingers to zoom in and out, much the same as you would with an iPhone photo. Yes, we all know a quick game of “I Spy” just doesn’t cut it anymore, which is why a team of image engineers and designers from Toyota Motor Europe (TME) and the Copenhagen Institute of Interaction Design (CIID) have been working on a “Window to the World” vehicle concept to turn those lengthy journeys into a joyful experience of play, exploration and learning. 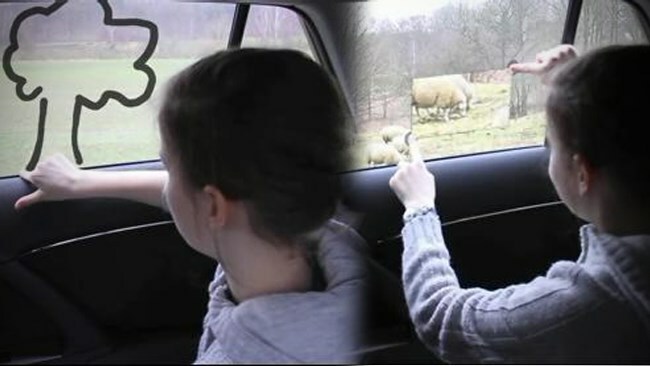 They’ve turned the windows of a car into an interactive surface, allowing passengers to touch the window and obtain information about objects as they go whizzing past. The top-of-the-range augmented technology also turns the glass into a canvas. Passengers can draw pictures using their fingers and watch their artistic output integrate with the outside world. CIID have also been working on other concepts for “Window to the World”, including a real-time translator that can tell you what you’re looking at in another language. Plus, you can pinpoint a landmark in the distance and find out exactly how far away it is. Then there’s the view from the sunroof. Normally a blur of treetops and power cables, but with “Window to the World” it’s now a stargazer’s dream, with a panoramic display of virtual constellations (including all the necessary information) which uses the actual sky as a background. Incredible stuff and you get the feeling that the handful of concepts that currently make up “Window to the World” are just the beginning. For now, though, fraught parents will just have to watch and wait for Toyota to fit this kid-calming glass in the latest Camry. Just one thing to remember when the technology does finally launch: NEVER LEAVE ANYTHING VALUABLE ON THE BACKSEAT. A smashed “Window to the World” is going to require a lot more than a quick trip to the local windscreen repairer.